Wow. Only two days to go until the end of the Mayan calendar. Whew! We’re finally here. I’m sure 21.12.2012 is going to be a WHOPPER of a day, let me explain why in this blog post. Firstly, have you been feeling the change in energies lately? Ascension symptoms might include unexplained anxiety, fatigue, restlessness and the desire to move on from painful situations…to go up the spiritual elevator so to speak, and see what’s on the top floor. That’s right – Universal 11 days like 12.12.2012 and 21.12.2012 are here to show us that Black equals White in a spiritual sense, it’s all a matter of Lighting! Where in your life have you been afraid of the dark? Where in your life have you been rushing along, trying to avoid your shadow side through overwork, lack or rest or worry? Has it worked? Isn’t is true that in life, we get stuck in fixed beliefs like ‘I can’t move on’ or ‘It’s all too hard’ until the ‘lights come on’ and we realise nothing stops us but our thinking? My belief is that we live in a kind Universe and the next step is always illuminated. Your life journey is a personal diary that only you can read and write in, and the trick is to live as if every word counts. Speak only truth and you will experience only truth. Speak only love and you will experience only love. If there are areas in your life where you have been lying to yourself, then 21.12.2012 will show you how to start all over again. URIEL (3+9+9+5+3) = 29 = 2+ 9 = 11…Uriel is the Archangel for Aquarians and he/she stands for brilliant ideas and ingenuity. 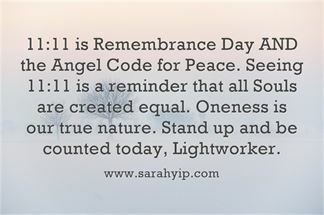 As they say the solution to war isn’t peace, it’s CREATIVITY 🙂 Seeing 11:11 on Clocks and repeating numbers is a sign you are an ambassador for the Age of Aquarius (equals creating democracy). JESUS (1+5+1+3+1) = 11 Even if you aren’t a Christian this is a beautiful sign that people are ‘getting’ the fact that unconditional love is the only way to move people on a mass scale…the public don’t care how much you know, only how much you care. Interestingly, BUDDHA adds to 22, another Master Number. SO – that’s my two cents for 21.12.2012. I expect we will see the biggest shifts in places with high 11 energy such as France, Germany, Sydney (Australia) and Africa. Wishing you all the best during this magical transition.